We have been reading a lot of Viking books lately (fictional and factual) but my daughter did point out a few weeks ago that the women Vikings are never the main characters. Which was true until now. 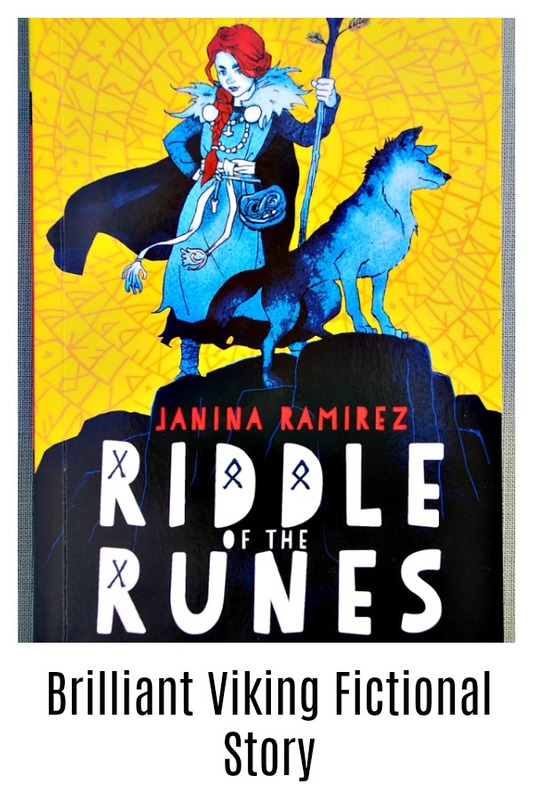 Oxford University Press kindly sent her a copy of the Riddle of the Runes book and the main character is Alva, a feisty Viking girl of “12 winters” (ie 12 years old – needless to say my kids are now telling everyone they are 10 winters or 7 winters old). We loves this character. She is a strong-willed, determined, clever girl in a normally male-dominated Viking village. My daughter could relate to the way Alva’s relationship with her Uncle and Mother has been written. Her Uncle and her absent father have always encouraged her more adventurous side while her mother worries about her and often that worry spills over into disagreements. (I really thought the sections about her different relationships within her family were really well written). 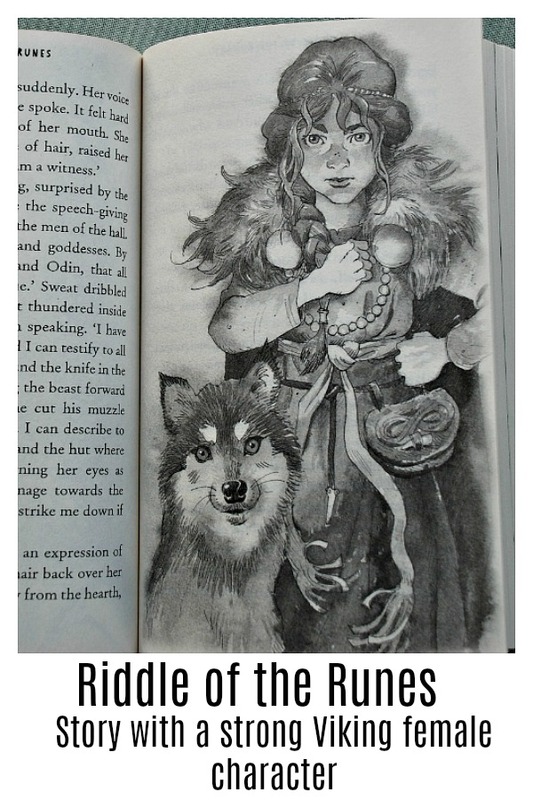 Oh and the fact that Alva has a pet wolf who would do anything to protect her was just the perfect final touch for my daughter (complete envy over the pet wolf). The Story is set in and around Kilsgard, the Viking village where Alva lives. Her father is away on a Viking journey and Alva is at home with her Uncle, Mother and baby brother. A series of events unfold in the village which cause concern around the safety of the villagers and Alva and her Uncle set out to find the answers as to why everything has happened. My daughter (who is 10) read the book herself. In the beginning she did initially struggle with the unusual character names and she was getting them a bit mixed up, so we created a quick visual map showing who the different characters were and then she was set and really got involved with the different characters. In fact when I was reading the book with my seven-year old and he asked a couple of questions about who everyone was she answered all his queries without hesitation. What I really liked about this book (aside from the fact that it is a well-written fictional story that captivated both my kids), were all the factual references. And they were accurate factual references (no dragons or magical coats included here). The way the village is described, the description of their house, the main hall, the village people – it all created a realistic image of Viking life. The author does not try to cover up the fact that part of Viking life included some blood and guts. In the story they mention that the Viking raids involved people getting murdered. It is not gruesomely depicted but at the same time it is not hidden. I liked this. There is also quite a bit about the Viking beliefs. They talk about how Vikings believed in many Gods but that Christians believe in one. They do mention a few of the Viking Gods throughout the story and there is a section where the town seer (my daughter thought she was a bit intimidating) demands the town has an animal sacrifice – the sacrifice never happens but it still was a great talking point for my kids. Oh and the fact that they are always making reference to a Viking raid in Lindisfarne thrilled my kids as there really were raids there (my kids had just read about this in a factual Viking book before we started this story). I really thought this was a good book for both my kids. The mystery side of finding out what has happened was fun but more than that the way the author managed to intertwine so many facts about Viking life was brilliant. I think it is a well-written fact-based fictional story for kids. And yes we were given this copy of the book and in case you are wondering I will be buying my daughter the next Alva adventure so she can continue reading about this feisty character. This entry was posted in Homeschooling and tagged Best kids books, children's book, History, home ed, home education, homeschooling, OUP, Vikings. Bookmark the permalink. Sounds like a delightful book! I would like the factual references as well. As the kids are getting older I am really enjoying finding these types of books where the authors manage to link in an interesting story with some historical facts.